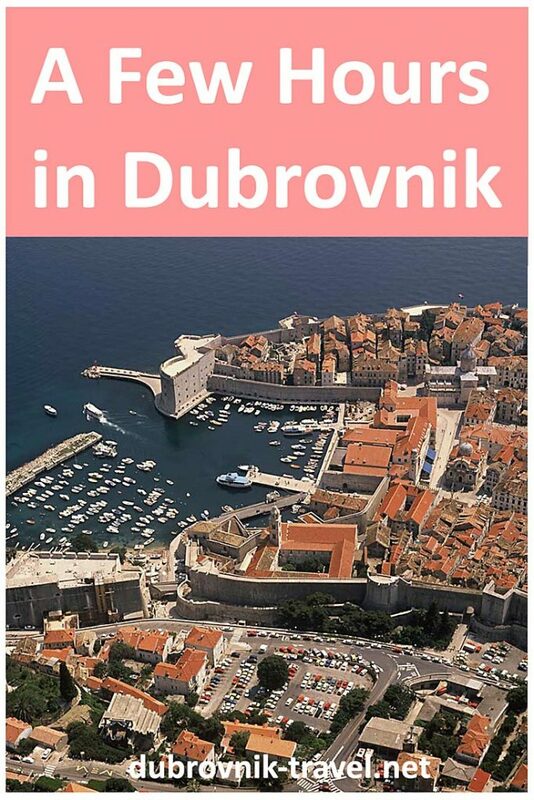 If you are planning to visit Dubrovnik just for a day trip and plan to spend just a few hours here, this is the itinerary that I can recommend so you can see the main attractions and points of interest in just a few hours of one day. 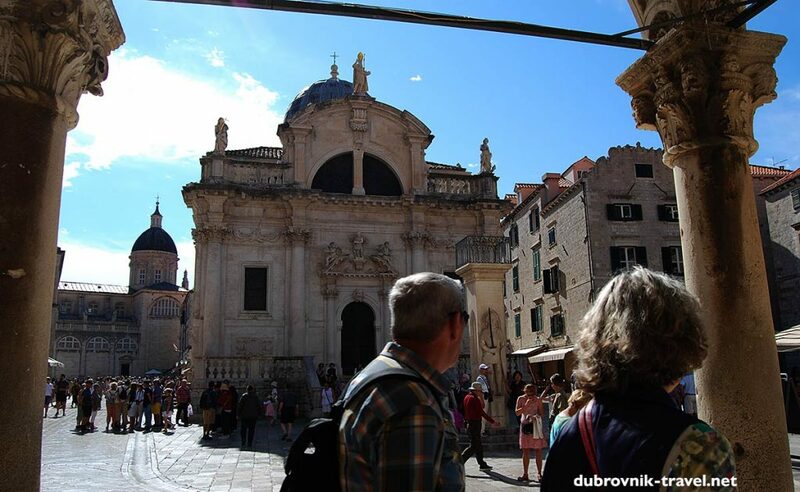 It is most likely that you will arrive in Dubrovnik during the morning and leave in the afternoon, so the first thing you should do is to go to the Old Town and focus your limited time on The Old Town exclusively. If you are arriving by cruise ship in the cruise port, or by ferry or bus, the best option is to take a taxi cab (or Uber) to the Old town. Alternatively, you can take a bus but it will just take longer. Or you can walk, but that would be time waste in your situation. Note, before getting into a taxi, ask your driver to take you to Ploce gate. This entrance to the town tends to be less crowded that Pile Gate . This is particularly important if your visit starts later in the day when the town gets busier. (1 hour) – The best part of the day to walk around the town walls is as early in the morning as possible. This way you will avoid the crowd and if you are lucky, be able to walk along the walls and take photos with almost no one around. Walk around the walls will take you about an hour. It will give you an initial wider picture of the town and help you in future orientation. Views from the town walls are truly amazing over orange rooftops, towers and fortifications as well as Lokrum and the Adriatic sea. As this walk includes quite a few steps, doing it at the beginning of your day is also a good idea. 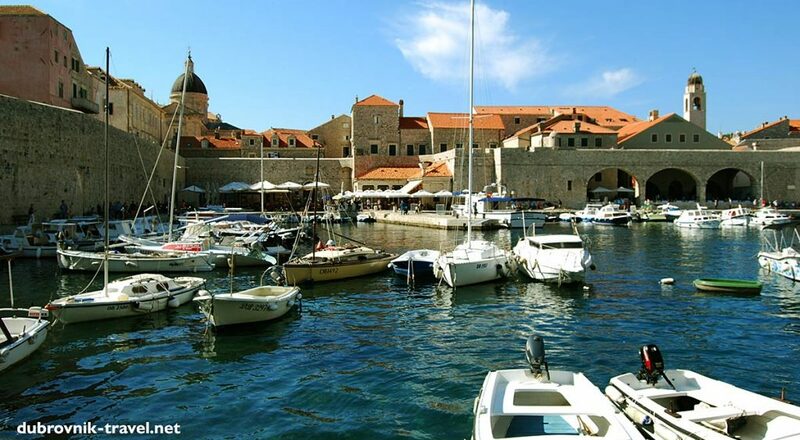 (1/2 hour) – If you are here in the hot summer, the Old Port is a much cooler area than inside the town walls. So here, you can take a break and refresh yourself with ice cream and short swim on Porporela if you feel like. There is plenty of shade along the walk and several benches that are very handy for short breaks while enjoying the views over Cathedral, Clock Tower and Dominican Monastery. Walk along the harbour will take you about half an hour and if you decide on a swim, give it another 1/2 hour. 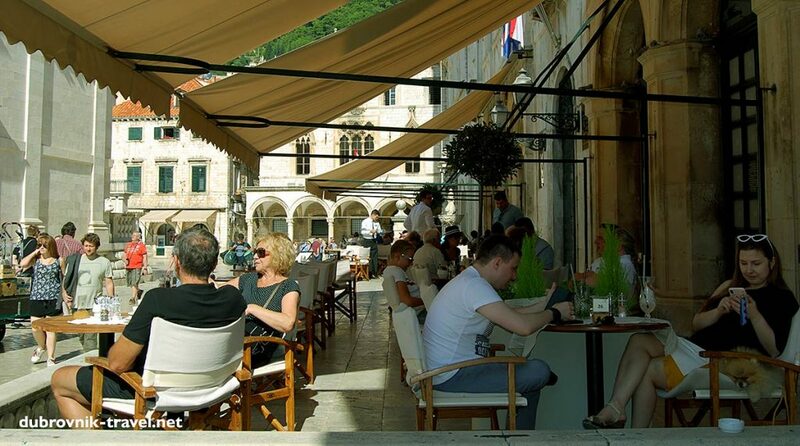 (2 1/2 hrs) – Walk back to Stradun and get coffee, a glass of wine, brunch, salad, snack or cocktail in one of the cafes. Try to take a strategic position which will enable you to see most of Stradun or Luza square. I usually take a break in Cele cafe or even better in La Bodega wine bar tables that are outside. Another good choice is Gradska kavana Arsenal (see below photo) with a slightly elevated terrace that offers great views of surroundings. From here you can see Luza Square, Sponza, The Clock Tower, Orlando’s column, Small Onofrio Fountain, St Blaise Church, Rector’s Palace and town’s Cathedral. Admire the old pleasing architecture while sipping your favourite drink. If you have time and energy visit Rector’s Palace, Cathedral or Sponza to see details inside of these lovely buildings. Walk along Stradun towards Pile Gate while checking souvenirs and shop windows. 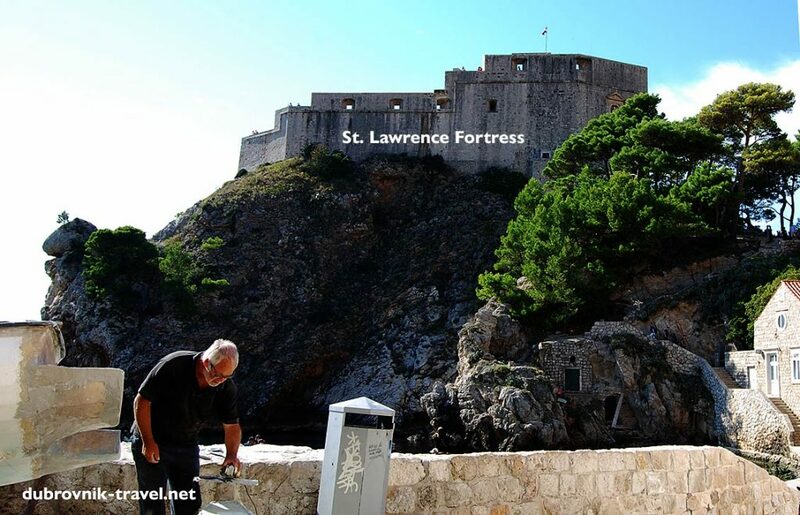 (1 – 2 hours) – Once you get out of the Pile gate, just turn right and within 10 minutes you will be in St. Lawrence Fortress. Make sure you have some energy left for climbing steps to reach the fortress (see below photo). While getting out of the fortress take a walk left down to Sulic/ Kolorina bay where you can have a swim and break if you wish with coffee or snack in the local beach bar. By the end of this sightseeing (about 6 hours), you will probably get tired so now is the best time to return to your ferry, bus or cruise ship. To get there, take a taxi at Pile or use a bus to reach your destination. I do this kind of visit to Dubrovnik very often, at least 4-5 times a year. It is either just for my own pleasure or if a friend who did not visit Dubrovnik yet came to stay with me on my island so we take the morning ferry to Town and the afternoon one back. The visit usually lasts for 6 hours and with smart planning, such day trips are always pleasurable. I know very well how to avoid hot part of the day by cooling down in the shade or on the beach, how to escape the crowd and find the best spots to enjoy the city. If you are visiting Dubrovnik as your stopover between two other places while travelling with luggage, you can still do the sightseeing as above. Just before the start make sure you leave your suitcase in the left luggage office in Gruz which is located within the main bus station. There is also a local travel agent in Gruz, very near the ferry port, next to Jadrolinija’s office that also has left luggage facilities. They charge just 30 kunas per suitcase which in your situation is the money well spend so you can explore the city with just your daypack, free to visit the town.